Can you dance in them? Make sure they fit properly and are comfortable. Will you wear them again? The first time I saw my sister-in-law's wedding shoes, I sighed with envy. They were the exact same ones I'd been eyeing on the Repetto site, despairing that heels never come in my size. A Cinderella mission lost in hope. On my next trip to Europe to celebrate our engagement in family, my future parents-in-law encouraged me to go to the shop to make sure they didn't have my size. Why not? An excuse to sight see and step inside a dreamy shop, trying not to get my hopes up too high, I dragged A towards the hubbub of Le Marais. Oh my goodness, he doesn't do well with crowds. Repetto is originally a ballet shoes company so I figured that their shoes must be made for dancing therefore comfortable. The shop front windows have tutus hanging like a romantic dream, conjuring up forgotten childhood memories of ballet classes pointing toes in pink tights and leotards. Inside are other ladies who must have also secretly dreamed of becoming a prima ballerina at some stage in their lives. Maybe these shoes will sprinkle some magic dust on us and we will feel like elegant dancing fairies in them. I ask if they could possibly have my tiny shoe size. The lady goes down the spiral staircase to check. I spy one lady in the corner trying out some new pointe ballet shoes. A real ballerina. Awesome. The lady comes back with two boxes. Yes, they have my size! They fit perfectly! They are perfect! It's a true Cinderella moment. 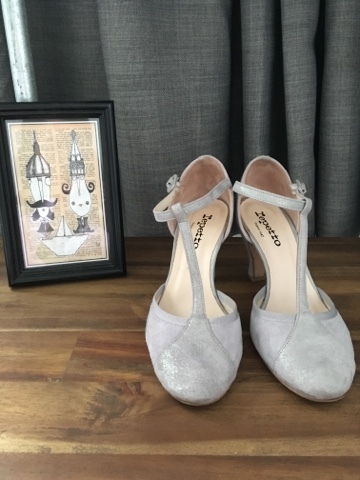 My wedding shoes are light grey with a slightly glittery T strap. I chose them because I could see myself wearing them even after the wedding, whereas I don't think I would have a white pair of heels. They are for special occasions only. They are also the exact same style as the ones my sister-in-law had for her wedding but I loved these so much I didn't care. Turns out, my other sister-in-law also liked them a lot - and will probably get the same pair in her size, too. Walking down the aisle in my Repetto heels and, later, waltzing on the dance floor in my Dad's, then husband's, arms, I definitely felt like a princess. If you are on the hunt for your own wedding heels, I hope yours make you feel like a princess, too.